تقی پور, حسین, ملک زاده, کرامت. (1397). مطالعه تجربی و عددی جذب انرژی در پانل های ساندویچی با هسته‌ی ذوزنقه ای پر شده از فوم تحت بارگذاری شبه استاتیکی.. علوم و فناوری کامپوزیت, 5(4), 565-574. حسین تقی پور; کرامت ملک زاده. "مطالعه تجربی و عددی جذب انرژی در پانل های ساندویچی با هسته‌ی ذوزنقه ای پر شده از فوم تحت بارگذاری شبه استاتیکی.". علوم و فناوری کامپوزیت, 5, 4, 1397, 565-574. تقی پور, حسین, ملک زاده, کرامت. (1397). 'مطالعه تجربی و عددی جذب انرژی در پانل های ساندویچی با هسته‌ی ذوزنقه ای پر شده از فوم تحت بارگذاری شبه استاتیکی. 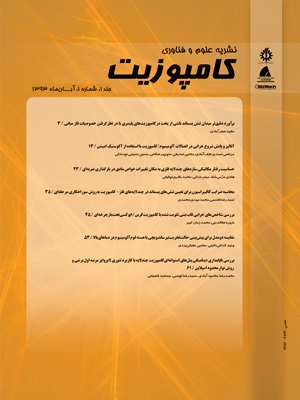 ', علوم و فناوری کامپوزیت, 5(4), pp. 565-574. تقی پور, حسین, ملک زاده, کرامت. مطالعه تجربی و عددی جذب انرژی در پانل های ساندویچی با هسته‌ی ذوزنقه ای پر شده از فوم تحت بارگذاری شبه استاتیکی.. علوم و فناوری کامپوزیت, 1397; 5(4): 565-574. در این پژوهش تاثیر روش پرکردن هسته های موجدار ذوزنقه ای شکل دو لایه، با فوم های پلی یورتان از نوع سخت با وزن سبک، مورد مطالعه قرار گرفته است. پنج نوع هسته موجدار از جنس آلمینیوم به صورت خالی و پر شده از فوم، تحت بارگذاری شبه استاتیکی به صورت، فشاری تک محوره قرار گرفته اند. در ادامه با استفاده از شبیه سازی عددی توسط نرم افزار آباکوس به بررسی پارامترهای ضربه پذیری، شامل جذب انرژی ویژه، بعنوان اهداف آزمایش می پردازیم. این نوع سیستم جاذب انرژی، می تواند در صنایع هوایی، کشتی سازی، خودروسازی، صنایع ریلی و آسانسورها جهت جذب انرژی ضربه مورد استفاده قرار گیرد. مقایسه ی نتایج حاصل از تحلیل عددی و آزمایشگاهی، نشان از همپوشانی بالا و تطابق خوب دو روش با هم دارد. نتایج تحلیل های اجزاء محدود و آزمایشگاهی نشان داد، که به کارگیری فوم در هسته، می تواند ظرفیت جذب انرژی را به صورت قابل ملاحضه ای افزایش دهد. در انتها پارامترهای هندسی مناسب، و بهترین نمونه ها از لحاظ معیارهای در نظر گرفته شده با توجه به اهداف طراحی، معرفی می شوند. Experimental and numerical study of Energy Absorption in foam filled Trapezoidal Compound core sandwich panels subjected to quasi-static loading. The aim of this research work is to investigate the mechanical properties of double layer trapezoid-shape corrugated core sandwich structures under quasi-static loading conditions and to determine the failure mechanisms and energy-absorbing characteristics of the corrugated cores. In this investigation, influence of foam filling technique in double layer trapezoid-shape corrugated core by using lightweight rigid polyurethane foam is investigation. Five types of Aluminum corrugated cores both bare and foam-filled were subjected to unidirectional quasi-static compression. In the following, using numerical simulation by Abaqus software to evaluation the impact parameters, including Specific Energy Absorption (SEA) as discussed testing purposes. the energy absorbing system can be used in the aerospace industry, shipbuilding, automotive, railway industry and elevators to absorb impact energy. The FEM results are compared with Experimental results which reveal a good conformity. FEM and experimental results showed that foam filling technique can significantly increase specific absorbed energy. Finally, appropriate geometric parameters and the best examples of criteria considered with respect to the objectives, are introduced. Guruprasad S. and Mukherjee A., “Layered sacricial claddings under blast loading Part I * analytical studies,” Int. J. Impact Eng., Vol. 24, pp. 975–984, 2000. Guruprasad S. and Mukherjee A., “Layered sacrificial claddings under blast loading. Part II - experimental studies,” Int. J. Impact Eng., Vol. 24, no. 9, pp. 975–984, 2000. Molatefi H. M. H., “Investigation on in-plane behavior of bare and foam-filled honeycombs in quasi-static and dynamic states by using numerical method,” Modares Mech. Eng., Vol. 14, No. 15, pp. 177–185, 2014. Shen J., Lu G., Zhao L., Qu Z. “Response of Curved Sandwich Panels Subjected to Blast Loading,” J. Perform. Constr. Facil., Vol. 25, No. 5, pp. 382–393, 2011. Kiliçaslan C., Güden M., Odaci I.K., Taşdemirci A., “The impact responses and the finite element modeling of layered trapezoidal corrugated aluminum core and aluminum sheet interlayer sandwich structures,” Mater. Des., Vol. 46, pp. 121–133, 2013. Kiliçaslan C., Güden M., Odaci I.K., Taşdemirci A., “Experimental and numerical studies on the quasi-static and dynamic crushing responses of multi-layer trapezoidal aluminum corrugated sandwiches,” Thin-Walled Struct., Vol. 78, pp. 70–78, 2014. Klçaslan C., Odac I.K., Taşdemirci A., Güden M. “Experimental testing and full and homogenized numerical models of the low velocity and dynamic deformation of the trapezoidal aluminium corrugated core sandwich,” Strain, Vol. 50, No. 3, pp. 236–249, 2014. Yahaya M.A., Ruan D., Lu G., Dargusch M.S., “Response of aluminium honeycomb sandwich panels subjected to foam projectile impact - An experimental study,” Int. J. Impact Eng., Vol. 75, pp. 100–109, 2015. Nurick G.N., Langdon G.S., Chi Y., Jacob N., “Behaviour of sandwich panels subjected to intense air blast - Part 1: Experiments,” Compos. Struct., Vol. 91, No. 4, pp. 433–441, 2009. Wadley H.N.G., Borvik T., Olovsson L., “Deformation and fracture of impulsively loaded sandwich panels,” J. Mech. Phys. Solids, Vol. 61, No. 2, pp. 674–699, 2013. Pirmohammadi N., Liaghat G.H., Pol M.H., Sabouri H., “Analytical , experimental and numerical investigation of sandwich panels made of honeycomb core subjected projectile impact,” Modares Mech. Eng., Vol. 14, No. 5, pp. 153–164, 2014. Pirmohammadi N., Liaghat G.H., Pol M.H., “Experimental investigation on ballistic behavior of sandwich panels made of honeycomb core,” Modares Mech. Eng., Vol. 14, No. 4, pp. 21–26, 2014. Feli S., “Analytical investigation of perforation of aluminum – foam sandwich panels under ballistic impact,” Vol. 13, No. 6, pp. 1–8, 2012. Taghipoor H., Noori M.D., “Experimental investigation of energy absorption in foam filled sandwich beams with expanded metal sheet as core under quasi-static bending,” Modares Mech. Eng., Vol. 18, No. 03, pp. 126–134, 2018. Taghipoor H., Noori M.D., “Topology Optimization Study in Energy Absorption of Lattice-core Sandwich Beams under Three-point Bending Test,” Modares Mech. Eng., Vol. 18, No. March, pp. 163–173, 2018. Rejab M.R.M., Cantwell W.J., “The mechanical behaviour of corrugated-core sandwich panels,” Compos. Part B Eng., Vol. 47, pp. 267–277, 2013. Rejab M. R. M., Bachtiar D., Siregar J. P., Paruka P., Fadzullah S. H. S. M., Zhang B., and Cantwell W. J., “The Mechanical Behavior of Foam-filled Corrugated Core Sandwich Panels in Lateral Compression,” in American Society for Composites Thirty-First Technical Conference, 2016. Mat Rejab M.R., Zaid N.Z.M., Siregar J.P., Bachtiar D., “Scaling Effects for Compression Loaded of Corrugated-Core Sandwich Panels,” Adv. Mater. Res., Vol. 1133, pp. 241–245, 2016. Zaid N.Z.M., Rejab M.R.M., Jusoh A.F., Bachtiar D., Siregar J.P., Dian Z., “Fracture Behaviours in Compression-loaded Triangular Corrugated Core Sandwich Panels,” Vol. 01041, 2016. Zaid N.Z.M., Rejab M.R.M., Jusoh A.F., Bachtiar D., Siregar J.P., “Effect of varying geometrical parameters of trapezoidal corrugated-core sandwich structure,” Vol. 01018, 2017. Alavi Nia A., Sadeghi M.Z., “The effects of foam filling on compressive response of hexagonal cell aluminum honeycombs under axial loading-experimental study,” Mater. Des., Vol. 31, No. 3, pp. 1216–1230, Mar. 2010. Zarei Mahmoudabadi M., Sadighi M. A., “A study on the static and dynamic loading of the foam filled metal hexagonal honeycomb - Theoretical and experimental,” Mater. Sci. Eng. A, Vol. 530, No. 1, pp. 333–343, 2011. Division U.T., “OPERATIONAL BENEFITS OF ELECTRONIC TOLL COLLECTION : CASE STUDY” Vol. 3, No. December, pp. 467–477, 1997. Company G. P. M., “Rigid Polyurethane Foam,” Last-A-Foam FR-3710, , Last-A-Foam FR-3720, 2017. Whisler D, Kim H., “Experimental and simulated high strain dynamic loading of polyurethane foam,” Polym. Test., Vol. 41, pp. 219–230, 2015. GraciaNo C., Martínez G., Smith D., “Experimental investigation on the axial collapse of expanded metal tubes,” Thin-Walled Struct., Vol. 47, No. 8–9, pp. 953–961, 2009.